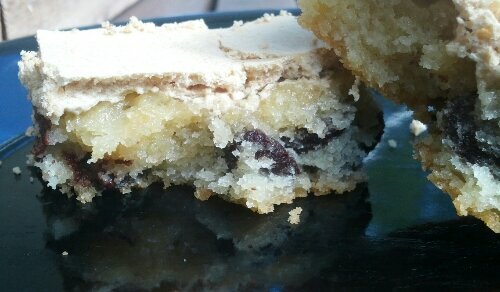 Chocolate Chip Squares is the name of this recipe according to my mother’s old recipe card. That doesn’t begin to capture what they are! They have an incredible almond flavor and a crunchy brown sugar meringue topping that melts in your mouth. I think they should be called “Almond Chocolate Chip Brown Sugar Meringue Heaven-in-a-Bite Bars”. Seriously. 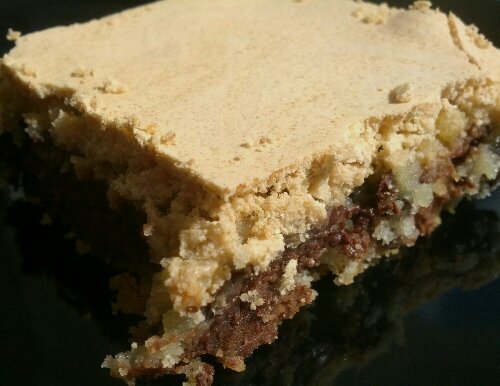 About a month ago this memory came to me about a cookie bar I remembered from my youth. I believe we had these when I was very young – not when I was a teenager and beyond. I called my mother but wasn’t sure my memory was at all accurate or that she would have any idea what I was talking about. I described to her this flavor that I remembered – specifically almond and meringue but not normal meringue. Maybe something like brown sugar or molasses? She knew exactly what I was talking about!!! 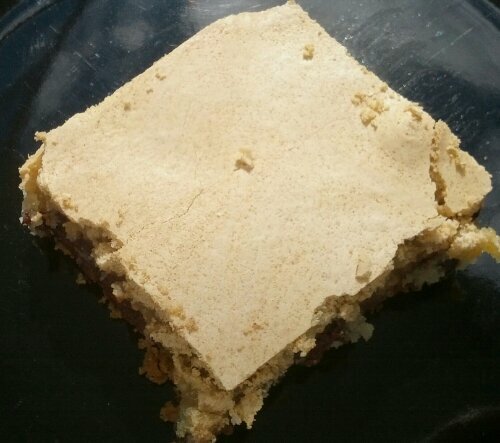 When she pulled out the recipe card and said “Chocolate Chip Squares”, I thought that couldn’t be it because as much of a chocaholic as I am, the chocolate was not the flavor I remembered. It was almond. Surely the name of them would mention the star of the show! But she started reading the ingredients to me and sure enough, this had to be what I was remembering. This is an old recipe – given to my mother from her mother and to her from her mother (my great grandmother, who was an utterly amazing baker and one of those real “grandmotherly” type grandmas!). Enjoy. Stir together the flour, baking powder & salt. In a separate bowl, cream together the (softened) butter (or shortening) and the 1 cup of sugar. Add the vanilla, almond extract, milk, 1 whole egg & two egg yolks. Mix all together. Add the flour mixture. Combine well. Add the chocolate chips. Stir so they’re evenly distributed. Spread in your greased 9×13 pan. In a separate bowl, beat the two egg whites until they’re stiff. Slowly add the brown sugar. 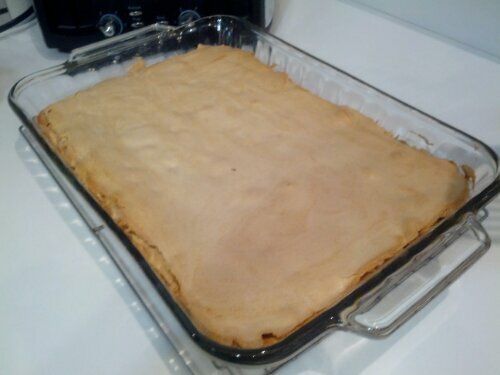 Spread over the entire dough mixture. Bake for 45 minutes at 325° (that’s what the recipe card said but considering my oven cooks hot, I only baked them for 35 minutes and they were done).